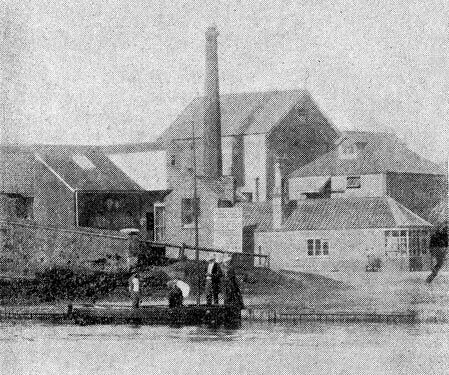 Wroxham steam mill, built beside the Bure was technically in Hoveton and was built over a cut on the north east bank. It is unlikely the mill was ever water powered, it simply used the river for transport and as a means to obtain water for the steam engine. The main structure was built of brick with a pantile roof with two lucums, one accessed via the river and the other over the road. The 1890 Ordnance Survey map lists the building as a flour mill. 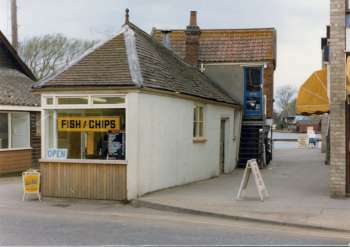 By the 1970s the only remaining section of the building was what was possibly the old bakery and this had been converted into a fish & chip shop. In 2003 the site was occupied by two restaurants and a variety of small businesses. 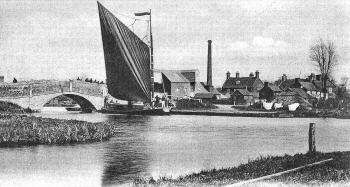 I can give you a bit more information about the steam mill at Wroxham Bridge. I was taken in there by my grandfather just before the mill was pulled down in the early 60s and it's remained a very vivid memory. The only remaining part is 'Ken's Traditional Fish and Chips' now, but I remember that this was the mill office where all the sales were done. The Granary was the most famous part of the mill: it stood on the other side of the Norwich Road (still on the Hoveton side of the river) on what is still called Granary Staithe - it featured on all the postcards and looked like a mill, so people often called it such although it was only a granary; I can remember some of the last trading wherries (then under power and not sail) loading there. I read with interest your article on Norfolk Mills and was surprised and delighted to know that there had been a windmill near Wroxham Bridge. I had no idea about the Windmill but did know about the bakery. About a month ago, in the course of researching my mother's family history, I went to Wroxham and Hoveton. I have been there before - probably as a child in the latish '40's and a couple of times since. My mother's aunt, Emmeline Baldwin, born Catfield, married a Frank Riches. I am not sure where he came from but according to his grave in Hoveton Churchyard he was "not of this Parish" but he was their Churchwarden for many years and was followed in this job by my mother's eldest brother. 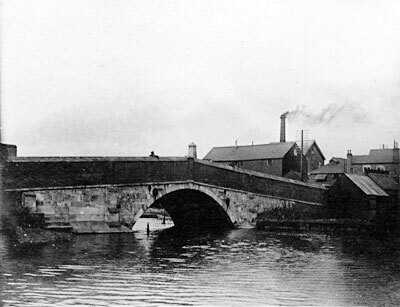 Frank Riches and Emmeline Baldwin had run the Bakery on Wroxham Bridge. There was the bakery which I believe was at the back, the shop and a tearoom. Frank Riches was a master baker. I met him once and he was also a very nice person. The Riches were my G Aunt and G uncle. The thing that intrigues me is that although my mother always told me the shop was "on the bridge" I never actually questioned her as to where exactly. I always thought, or she intimated, it was on the left as you come into Wroxham over the bridge from Norwich. The day I was in Wroxham and checking the grave in Hoveton Church I met an absolutely delightful elderly lady who was paying her respects to her deceased husband. She knew the Riches well and she told me/confirmed for me, that this is where the bakery was. She also told me that she used to be sent down to buy bread as a child and dreaded going because Emmeline Riches was a fierce lady. I met her, she was my great aunt and I would agree with the lady, she was definitely a force to be reckoned with. I believe Frank and Emmeline Riches had one child only who died in infancy. When they retired they moved into a beautiful bungalow which is on the right as you go from Wroxham to Hoveton but only a short way from Wroxham. When I visited her with my mother, this was where she was living. I am attaching (I hope) a copy of the bakery (only the back is original). My husband and I are reasonably sure we got the right building because the elderly lady we met told us it was now partly a Chinese Restaurant - my husband also risked life and limb trying to cross and re-cross the road at that point. It is an incredibly busy road - it must be so different from how my mother remembered it because she used to be taken to church on a Sunday on a "buggy". I don't think that form of transport would survive there now. I hope I have the right place for the bakery, shop and tearoom, albeit in a replacement building now. 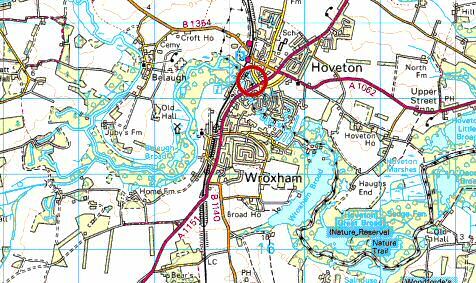 I lived in Hoveton until the age of 26 & the recent EDP article on the devastation along the River Bure villages during 1912 caught my interest as to its possible consequences around the Wroxham area. From this I found the “Aysham Navigation” & the “Norfolk Mills“websites leading to the “Wroxham Steam Mill” page which brought back many memories. Being born in 1940 about 300 yards north of the mill on Tunstead Rd & just 1 week before the eldest son, Roger, of the mill manager Mr Hutchings, I spent much of my childhood playing around the mill which was owned by Barclay, Pallett & Co Ltd whose offices adjoined The Paston School in Grammar School Rd, North Walsham. 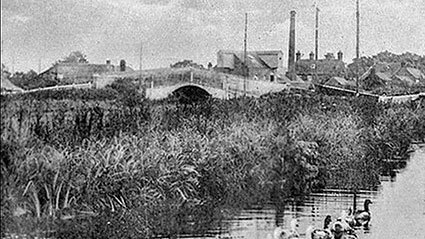 As I recall the mill (actually in Hoveton) was powered until its closure by a gas engine & attending Wroxham School & St Mary Church I must have walked across the river bridge separating the 2 villages at least a dozen times weekly for some 8 years I have no recollection of the large chimney shown in the 1910 photograph. The two 1977 photographs show the front & rear of the office, now a fish & chip shop with a less ornate window, was situated to the left of the millyard entrance & the external wooden stairway led to a disused room that we frequently played in. The bakery & tearooms mentioned by Sue Cassidy were to the right of this entrance & I can recall the bread being retrieved from the baking ovens, I'm sure this was signed & known as Jubbs Bakery. 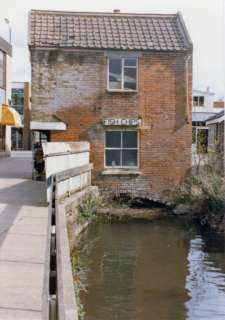 The river cutting to the rear of the mill offices shows a culvert which could have been used for deliveries or for the water supply to the original steam boiler or improbably have been connected to the cutting between the old granary & the Hotel Wroxham sites, I recall the mill cutting as having a path along its edge, the mill building overhanging this & it being smelly & stagnant with no flow. 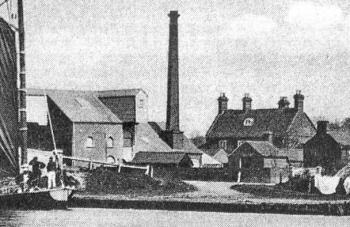 The part of the mill furthest from the cutting was brick built, the bottom floor being at or just below ground level having unglazed windows & the floor permanently wet. This held a lot of rusting line shafting & I just cannot remember seeing this running. Alongside this building was a row of single story buildings with large doors that were possibly redundant cart sheds or stables. The mill not only handled flour & meal but also cow cake? This was a brown biscuity type material delivered to the mill as a slab roughly the size of a domestic door mat which was fed vertically into a hand operated crusher not dissimilar to an old washing mangle whose 2 shafts had spurred wheels which broke down the feed into golf ball sized pieces. The granary was situated across the Norwich Road just off the river bank where the wherry is moored in the 1900 picture & was a timber clad building with a sack hoist overhanging the river, the building being built on stilts which at some point had been totally enclosed but having a pair of large hinged doors big enough to accept a truck. The wherry could well be the Albion skippered by Nat Bircham in the 60's & which sometimes moored there to collect sugar beet, I also had my first sighting of a live coypu in its open hold, you really had to see one to realise just how large & fearsome these were - imagine a water rat at least 2 feet long! The demolition of the mill was inevitable & I am amazed not to find much of its history recorded elsewhere but maybe my memories will jog others. Henry and Horace Harry Burroughes appear in the 1881 census. Henry was the brother of my wife's Great Grandfather Daniel Burroughes, as was Barnabus Burroughes of Aslacton_Windmill. They were sons of Thomas Burroughes of Kenninghall_Post_Mill. The son of Barnabus Burroughes went on to sire the owners of Burroughes of Bressingham which went bankrupt a few years ago. One of the family is still alive.